Brief Description: Carrie is an intuitive, artistic and psychically aware young woman, whose partner and soon-to-be husband can offer her security and provide for her every material need. Her whole life seems to be mapped out and she should be happy, but inner voices are trying to tell her otherwise. 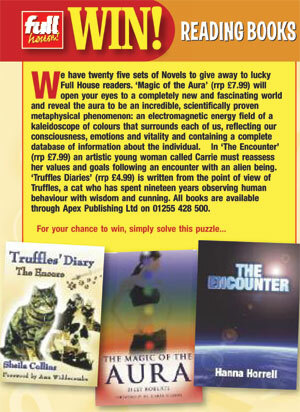 Following a strange encounter with an alien being, Carrie is forced to reassess her values and goals, and decide whether to accept an important invitation – to be an ‘Earth Master’, responsible for helping the planet achieve a necessary transition according to the cosmic plan and for guiding others into the ‘Family of Light’. Drawn together with like-minded people in a fellowship of unity and co-operation, Carrie learns much about life and love, and shares knowledge that has been relayed to her both from her ‘cosmic partners’ and from her inner self. But this is only the preparation stage. A new and exciting journey awaits – the trip of a lifetime. 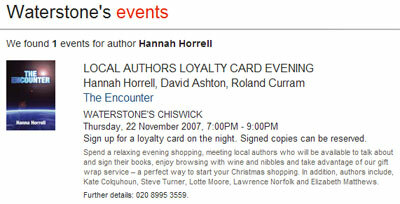 About the Author: Hanna Horrell, now living in Chiswick, West London, was born in Warsaw, Poland and moved to England in 1984, where she studied Accountancy and English Language at Thames Valley University, Ealing. 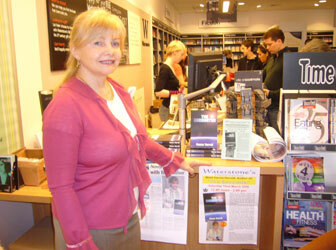 Although she subsequently worked as an Accountant for many years, her true passion has always been writing. 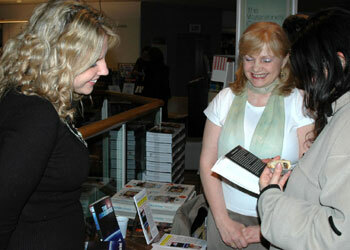 The Encounter is her first novel. A good read, an exciting story. 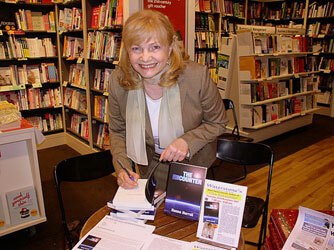 The Encounter is a thought provoking, yet relaxing and pleasurable read. It subtlety highlights the issues of horrifying, lawless and selfish society, which government and religion have failed to address successfully. 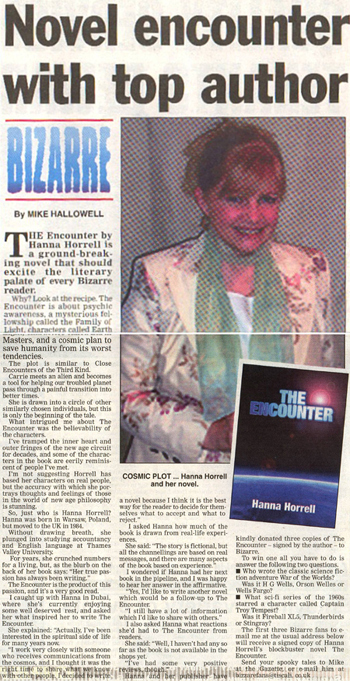 So, this being the case, Hanna Horrell has developed a story and its characters to save the world. Carrie, the main character, encounters Amos, the alien, the god beyond god, whom engages her to help secure the positive cosmic energy that humans have misplaced. 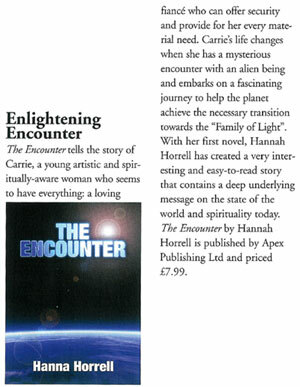 The encounter changes Carrie's life with a quest of gathering a band of cosmic understanding friends and a civilised sanctuary where humans can actually work for the good of each other without threat or profit. The story is set in the summer season and one can imagine relaxing on the veranda of our own sanctuary; escaping from the reality of life while reading Hanna's book; thinking if one can be more positive towards harmony, unity and co-operation. 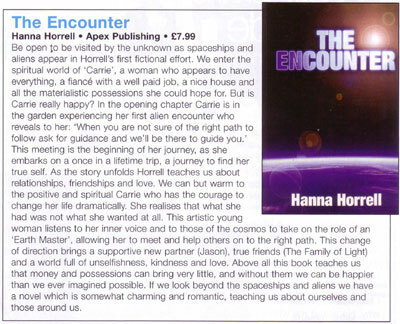 The negative issues of society often inspire an author to write a heartfelt book, which Hanna has achieved with The Encounter. The grass appears to be greener with the changes that Carrie has made in her life with the help of a new love in Jason. However, will the journey be greener on the far side beyond the earth? I hope there is more cosmic energy on the way so we can find out if Carrie and Jason can return to save Planet Earth from the destruction of ignorant humans. 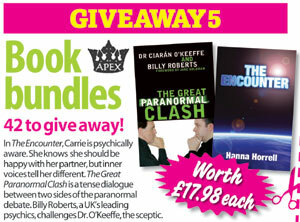 I recommend you escape into The Encounter and wonder if there is a saviour within or beyond our universe. This is a novel, but also so much more than a novel. The idea behind the book is to spread channelled information in a format where positive information is a natural part of the story. Getting alternative information into popular culture, whether this be in the form of novels, films or music is something I’ve spoken with a few friends about in the past, so I was excited when I got a phone call about this book and was offered a copy to review. The story follows Carrie, an artist who is very psychically aware. She has been hearing voices for some time and finally meets the source of the voices, an alien being called Amos who gives her the task of bringing people together to spread light into the world. The story is woven around Carrie’s ability to channel information from alien beings and the “living library” and the message of co-operation and moving forward in a positive way comes through very well. The story basically tries to include as many positive ideas as possible, including things like growing your own organic food, positive music, energy healing, etc. None of this detracts from the story, which has lots of interest and sub plots to keep the reader engaged throughout. In some places, too much irrelevant detail is given, especially for us raw fooders, the detail about what food was being cooked including lots of meat, was quite distracting. Surely people as highly evolved as the lead characters in this story would have worked out that at least vegetarianism was the way forward! Highly recommended, and if there are any authors out there, read this book and then write your own which also includes messages about eating healthily! 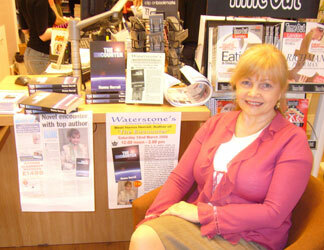 It was a difficult read but one I am sure whose who enjoy this type of fiction will be drawn to. The inner turmoil and many dilemmas the character encounters leading her through a variety of routes to self-discovery is a theme many will feel close to their own experiences. The alien encounters and uses of crystals and being called to a 'higher path' will, I am sure, resonate with some as being a part of a message they need to hear. I was gripped by this novel from start to finish - and was left wanting more - I do hope there is a sequel so that we may follow Carrie and Jason's exciting journey. For a first novel I was pleasantly surprised that The Encounter was written with such poise, feeling and insight, and I feel sure it is destined to be a bestseller. It will appeal to both followers of New Age writing as well as those who are curious to know more - anyone who enjoyed Philip Pulman's "His Dark Materials Trilogy" will appreciate "The Encounter". 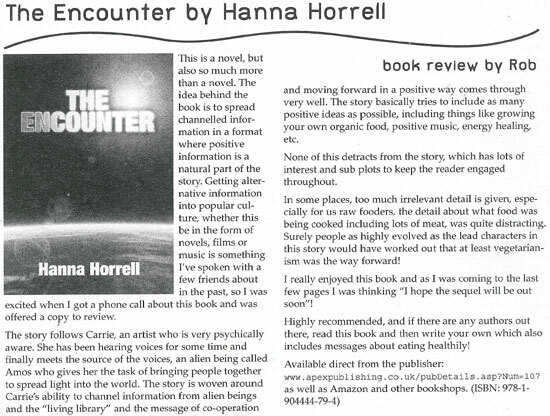 Hanna Horrell is either very knowledgeable of many new ages paths or she has researched her subject extremely well - making the novel all the more credible. More please! This book won’t suit everyone, but to the other 99% who have a working brain it should prove a useful addition to their library. 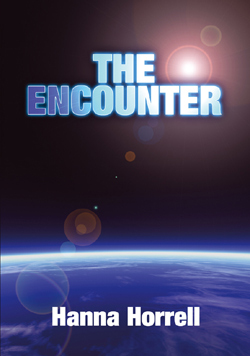 The Encounter is strictly a work of fiction, but is it really? I suspect not. I’ve tramped the inner heart and outer fringes of the New Age circuit for decades, and some of the characters in this book are eerily reminiscent of people I’ve actually met. I’m not suggesting for a moment that Horrell has based her characters on living personages, but the accuracy with which she portrays the thoughts and feelings of those within the world of New Age philosophy is stunning. The plot is similar in some ways to that of Close Encounters of the Third Kind. Carrie meets an alien, and becomes a tool for helping our troubled earth pass through a painful transition into better times. She is drawn into a circle of others who have been similarly chosen, and that, really, is only the beginning of the tale. “Why dig into the brain for answers?” asks one of the characters, named Jason. Herein lies the wisdom that underpins this cleverly-crafted novel. The human intellect is often left wanting, and spiritual answers often provide far more workable solutions to both personal problems and burgeoning global calamities. In all seriousness, Hollywood producers looking for the next big groundbreaking movie could do a lot worse than focus on The Encounter as a possible candidate. Fiction? Maybe, but The Encounter could be a true-life adventure just waiting to happen. Not to be missed. This book is fantastic, I couldn't put it down, is there going to be a follow up? I hope so! An amazing book with a great deal of new viewpoints of old, and new understandings, an exceptionally well written account with aliens where a remarkable amount of insight is used to help various friend to understand Cosmic Knowelege, and the ways of the cosmos, through example, and the ending leaves open the possibilities for a very exciting sequel, as a journey commences, well worth a read. The Encounter is a fascinating book I couldn’t put down. I hope Hanna writes another book on Carrie and Jason’s adventure in the spaceship. Hanna is an excellent writer. 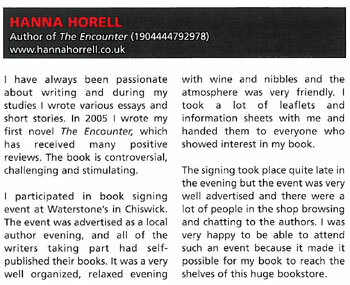 Hanna Horrell signed copies of 'The Encounter' at Waterstone's, Chiswick, London.